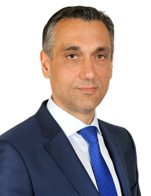 Evangelos Chatzis is the Chief Financial Officer and Secretary of Danaos Corporation. Mr. Chatzis has been with Danaos Corporation since 2005 and has over 21 years of experience in corporate finance and the shipping industry. During his years with Danaos he has been actively engaged in the company's initial public offering in the United States and has led the finance function of the company. Throughout his career he has developed considerable experience in operations, corporate finance, treasury and risk management and international business structuring. Prior to joining Danaos, Evangelos was the Chief Financial Officer of Globe Group of Companies, a public company in Greece engaged in a diverse scope of activities including dry bulk shipping, the textile industry, food production & distribution and real estate. During his years with Globe Group, he was involved in mergers and acquisitions, corporate restructurings and privatizations. He holds a Bachelor of Science degree in Economics from the London School of Economics, a Master's of Science degree in Shipping & Finance from City University Cass Business School, as well as a post-graduate diploma in Shipping Risk Management from IMD Business School.